Memo: These pictures are of a new coach. Actual pictures on request. 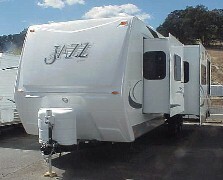 At 31-1/2', this mid range Travel Trailer will fit in most parks. Importantly, there's value where it counts: "Quality, Price, Pizazz... We've used our 40 years of experience to search the market and bring you the best: JAZZ! First, some of the things you can't see: Construction is aluminum framing covered with molded fiberglass on the exterior insulated and sealed underneath... and the finest materials inside. This Travel Trailer brings you residential living on wheels. Perfect! 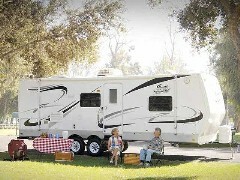 This model 280FQ Travel Trailer is laid out well. Queen 60" X 80" bed up front on it's slider with deluxe windows. (Day and night shades of course.) Double hardwood mirrored pocket doors open the room to the central main living area. Galley with bar, dinette, sofa bed and Home Theater System make surround a large family area. Across the rear is the bathroom with china pedal toilet, large corner shower and lots of counter space with built in blow dryer. Upscale fixtures of course. Most RV bathrooms have no windows. JAZZ does it right. Ammenities are what you'd expect. 8' 2door refer with raised wood facings. 15,000BTU ducted A/C. Large 60/40 acrylic sink with single swivel faucett. Microwave with turn table. Little things that count... things we sometimes never get around to are all professionally placed; like a built in coffee maker, Dust Buster vacuum, mounted rechargable flashlight. A biggie are the cool view large tinted windows with day/night shades. IN short: Comforts galore! "And that's not all..." Step outside through the wide door with assist handle and relax under the A&E roll out awning. Favorite sounds follow through outside speakers. There's even a convenient shower.